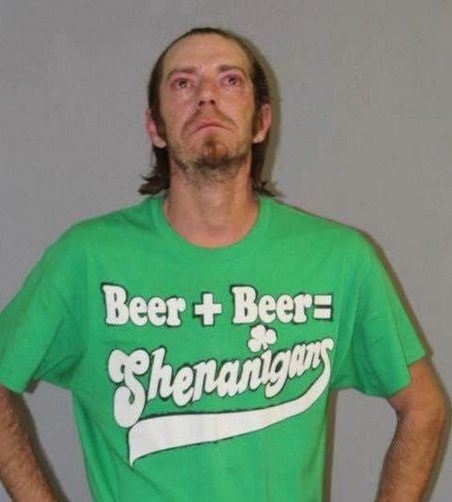 A Connecticut man wearing a “Beer + Beer = Shenanigans” t-shirt was arrested Saturday night for drunk driving. Nathan Corey, 38, was collared after a Connecticut State Police trooper pulled him over around 10 PM upon spotting Corey’s vehicle striking a sidewalk (and violating other traffic laws). Corey, cops say, failed subsequent field sobriety tests. A police search also turned up marijuana, drug paraphernalia, and a small machete. Booked on an assortment of criminal and vehicular charges, Corey was freed from custody after posting $10,000 bail. He is scheduled for an October 3 appearance in Superior Court.